The Berlin Wagons have the NO-TIP® safety steering which is exclusive and available only with Berlin Wagons (The Wheel assembly doesn't extend past the front end). Berlin Wagons come with three different wheel sizes, the largest Wagon has that "Heavy Duty" look. All Berlin Wagons are USA made and have a varnished natural wood bed with painted hardwood stakes. Nominal size includes the rails. The 600, 410 and 310 models are available in fun green or the standard red color. This is a smaller version of the Berlin Flyer Wagon having the same quality construction with two wheel sizes, 10 inch hard or the huge 10 inch pneumatic tires, for a "Big Wheel" look and flotation. 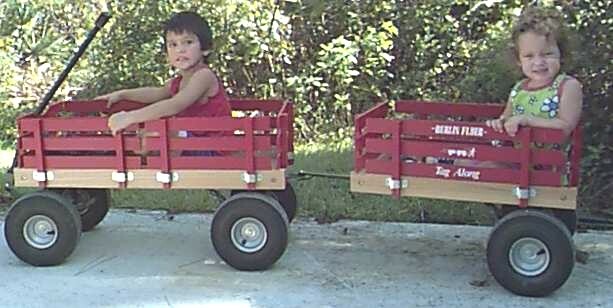 The most popular Wagon size with the color of your choice fun GREEN or RED. There are three wheel sizes to choose from, 10 inch hard, large 9 by 2.5 inch or the huge 10 by 3.5 inch pneumatic tires. Ideal for the Berlin Wagons comes with a hitch for easy attachment & removal, available in fun GREEN or the standard RED colors. Three wheel sizes to choose from, 10 inch hard, large 9 by 2.5 inch or the huge 10 by 3.5 inch pneumatic tires.